The main products of this division are shown below. Kobe Steel's welding consumables are produced under rigorous standards and famous for their high stable quality, ranging from covered electrodes to automatic / semi-automatic welding wire and flux with approximately eight hundred kinds. The excellence of their quality and service is highly appreciated by the broad area of industry, acquiring reputation that no other competitors ever come close to. Kobe Steel's Welding consumables for stainless steels have superb corrosion resistance and heat resistance against diverse environments, providing extremely various uses. Covered electrodes have 'NC series' that show advatages in stable arc and re-arc performance. Flux cored wires, which are highly efficient and easy to weld, have 'DW stainless series'. These welding consumables have been applied for many energy power plant such as desulfurization reactors, pressure vessels for atomic power reactors and high-temperature high-pressure boiler. Excellent crack resistant enables fabrication of thick heavy section. And good mechanical properties can be obtained after long term PWHT. 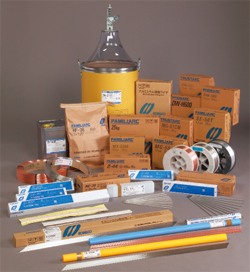 Many kinds of consumables are prepared for steel type and welding process. The ARCMAN prossesses more advanced welding skill than a man can possibly have with the advantage of high speed constant welding quality. Our various types of welding robot systems for steel column fabrication, bridge, construction machinery, etc. contribute significantly to unmanned welding. Our off-line teaching system, which has received high recognition in the industry, is the culmination of years of experience and unsurpassed welding procedure know-how.